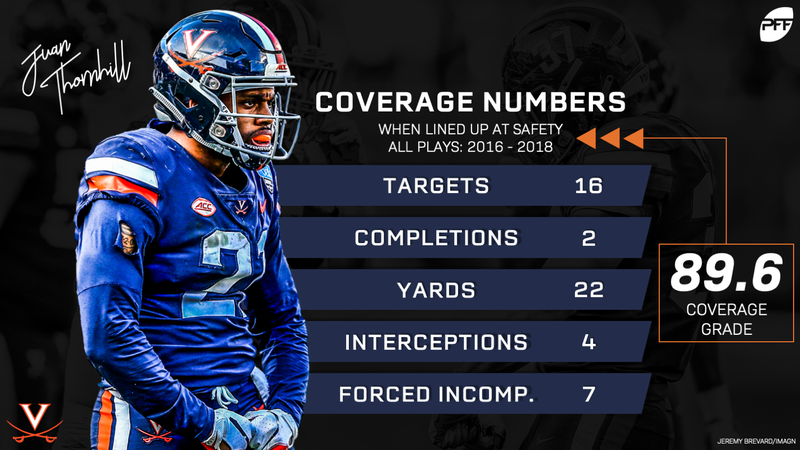 Coverage versatility is a hot commodity in today’s NFL and Virginia’s Juan Thornhill has been a common name in NFL circles when referring to the 2019 NFL Draft in recent weeks. 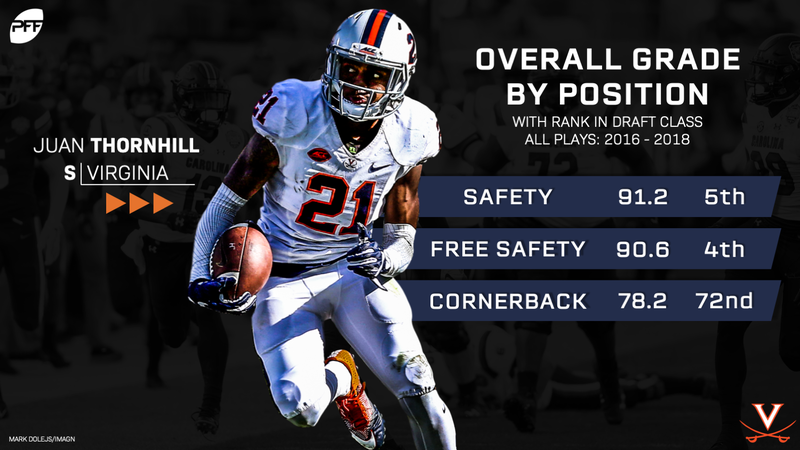 A former cornerback, Thornhill found a home at safety in 2018, posting an 89.3 overall grade that ranks third among FBS safeties in the draft class. He’d already been making great strides at cornerback, after grading at only 64.3 with a passer rating allowed of 103.5 back in 2016, Thornhill improved to grade at 81.0 overall in 2017 to go with a passer rating of 69.3 into his coverage. Even with the improvement, a move to safety in 2018 may have been just what Thornhill needed in order to improve his draft stock. He’s been fantastic in that role, grading at 91.2 at all safety positions, fifth-best in the draft class over the last three years. When isolating to just free safety, Thornhill grades at 90.6, fourth-best in the class during that time, albeit on a small sample size of only 178 snaps. Still, he’s shown an excellent feel for playing deep zone, combining the ability to quickly diagnose plays with the athleticism to break on the ball and make plays at the catch point. On the other hand, Thornhill’s numbers at cornerback are pedestrian when compared to the rest of the class. Even with the 2017 improvement, his 78.2 overall grade ranks just 72nd in the class over the last three years and his coverage grade of 70.1 ranks 139th. He certainly had a few flash plays when playing outside, but overall, Thornhill has looked more comfortable as a deep safety, both in coverage and in the run game where he’s been excellent. Thornhill’s coverage numbers have been sensational when lined up at safety. Despite a small sample size, his coverage ability does shine through. Opponents have completed only 2-of-16 attempts into Thornhill’s primary coverage at safety and he’s come away with four interceptions while forcing incompletions on seven of the 16 targets. Still, NFL teams may look at Thornhill’s 6-foot, 205-pound frame and project him at cornerback where his size and athleticism are intriguing for the most valuable position on the defense. He had an excellent showing at the NFL Combine, running a 4.42 40-yard dash while putting up some of the best all-time numbers in both the vertical jump (44 inches) and the broad jump (141 inches). The jumps were reminiscent of Dallas Cowboys CB Byron Jones, who set records with a 44.5-inch vertical and a 147-inch broad, all while dominating the agility drills and running a reported 4.36 40 at his pro day. While Jones played cornerback in college, he started his career as a safety and in the slot for Dallas, before successfully transitioning outside for the Cowboys last year and performing as one of the league’s best corners. That may have a few teams looking at Thornhill’s similar size and athletic profile to give him a shot at cornerback before moving back to safety as a worst-case scenario. 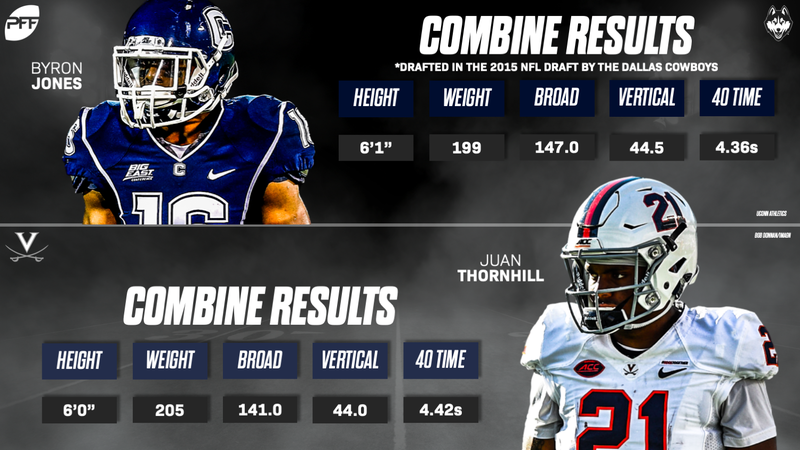 Either way, Thornhill’s progression at Virginia makes him one of the draft’s most valuable assets in the secondary and he should have his name called by Day 2 at the latest come draft weekend.